playful innocence of a child, reflecting on her momentary transmutation. Slowly, the young girl retreats back through the water to an undefined afterlife or space beyond. Museum of Modern Art, New York, Viola uses water to epitomize Buddhist beliefs of the transitory and immaterial nature of the world. 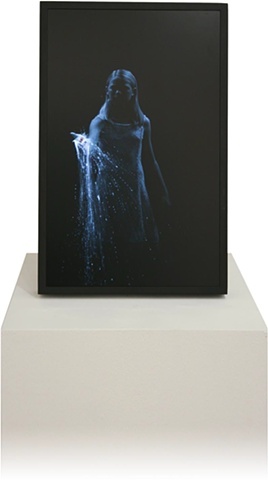 In The Transfigurations Series, his latest examination, he uses water as an expression and definition of the divide between life and death. The poses of the figures also recall moments from historical painting, including renderings of Adam and Eve’s expulsion from the Garden of Eden. The passage of each figure through the watery veil thus symbolizes the moment of transfiguration or metamorphosis of the mortal body into a more spiritual and sentient existence. The Self is an ocean without a shore. Gazing upon it has no beginning or end, in this world and the next. many ways, has been the impetus for my work over the past several decades. then returning to the shadows. very fiber of their being, finally radiating outward to affect everything around it. to be crossed. However, the decision to cross the line, whether real or imaginary, is a serious one and the personal stakes can be high, as the look on the faces of the performers experiencing the work reveals. world left behind, while for others it was an exorcism, or a purification, a rebirth, the conquering of fear, the release from suffering, the loss of innocence, the cleansing of a memory, or the healing of a wound. Most of the time I did not know the precise nature or origins of their experiences and, like everyone else, I could only witness the outward results of their personal struggles. They were given minimal instruction. My only stipulation was that everyone who came through the water must, at a certain point, make the decision to turn away from the light and return to the shadows. The time here needed to be finite. towards the eye of the cameras-one black and white night vision to see into the darkness, the other color High-Definition to capture all the physical details of the material body). A special system was used to create an invisible sheet of water that the individuals would pass through, creating streams of luminous liquid light that appear to emerge out of their bodies. The participants all described how the water seemed to erase their preconceived ideas and wash them into the present moment. Many wanted to go back again. In this way, the water and light threshold, a physical construction in my studio erected by a team of technicians, became an instrument in service to the inner needs of a disparate group of peoplesome professional actors, others artists, colleagues, friends and family members.